The latest hostilities in Tripoli come within the context of the Libyan National Army’s (LNA) Operation “Flood of Dignity”, aimed at eliminating local militias operating within the capital, and the Government of National Accord’s (GNA) counter-offensive, Operation “Volcano of Wrath”, aimed at preventing the LNA from taking control of the city and its surrounding areas. 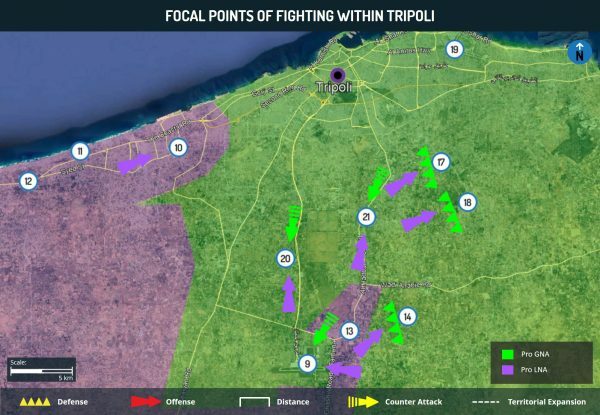 Although, the LNA managed to swiftly take control of several areas west and south of Tripoli within the first three days of the launch of Operation “Flood of Dignity”, the unification of militias within Tripoli under the umbrella of the Tripoli Protection Force (TPF) will present the LNA with challenges in making further territorial advances within the capital. The April 8-9 Islamic State (IS)-perpetrated attack in al-Fuqaha bolsters our previous assessment regarding the potential increase in threat of militancy in the country over the coming weeks and months, as militant group’s attempt to take advantage of the LNA and GNA-linked forces’ preoccupation in hostilities in northwestern Libya to ramp up their operations within the country, without the threat of being detected by security forces. Overall, the security situation in Libya is likely to significantly deteriorate over the coming weeks and months. As the LNA’s Operation “Flood of Dignity” becomes protracted, as a result of strong defensive measures adopted by GNA-linked forces, it will be compelled to divert further troops from other parts of Libya towards Tripoli. This will allow IS to regroup in eastern and southern parts of Libya and increase the frequency of its operations over the coming weeks. March 28 Ghadduwah Islamic State (IS) claims killing of two Libyan “agents” and kidnapping of others in an attack. April 2 Sebha Reports indicate that “heavy machine gunfire” was heard in downtown Sebha. April 8 Murzuq Government of National Accord (GNA)-linked forces reportedly seize control of the Murzuq checkpoint from Libyan National Army (LNA) forces. April 1 Bani Walid A GNA team representing Libya’s Airports Authority inspected the Bani Walid Airport to reportedly prepare it to receive civil flights. April 8-9 al-Fuqaha IS militants reportedly entered the town of al-Fuqaha during the overnight hours of April 8-9 in 13-15 vehicles and cut off all communications to it. The militants also executed the head of the local council and of the municipal guard as well as burned down houses. April 9 Sukhna GNA aircraft from Misrata reportedly conduct airstrikes against LNA positions in Sukhna. The LNA accused the GNA aircraft of targeting a civilian farm. April 1 Sirte Reports indicate that Sirte’s Gaddhafi tribe is demanding the departure of the Sirte Protection Force following the reported killing of a member of the tribe by the latter. April 1 Gate 50, east of Sirte GNA-linked forces reportedly reached “Gate 50” from Sultan, establishing a checkpoint in the area. April 8 Susah, Tobruk The LNA reportedly discovered and dismantled IEDs in a vehicle in Tobruk. In Susah’s Sunday market, LNA forces dismantled an adhesive bomb on a car. March 30 Western Region LNA Field Marshal Khalifa Hafar appoints Abdulsalam al-Hassi as commander of the LNA’s Western Region Operations Room. March 31 Tripoli The LNA confirms its readiness to enter Tripoli to eliminate militias and other armed groups. April 1 Tripoli The Tripoli Protection Force (TPF) issues a statement confirming its participation in a meeting regarding the unification of armed forces in the region. April 3 Tripoli The UN-backed Government of National Accord (GNA) releases a communique denouncing the latest advancements by the LNA in areas south of Tripoli, stating that the government has ordered the general mobilization of all military, security, and police forces to prepare for a response to any attack on the capital. 1 April 4 Gharyan LNA Spokesperson Colonel Ahmed Mismari confirms the peaceful entrance of the LNA into Gharyan. LNA Commander of Western Region Operation Room, Abdulsalam al-Hassi announced that the LNA is in control of Gharyan. April 4 Tripoli Secretary General of the UN, Antonio Guterres, denounced the current instability in a visit to Tripoli. April 4 Tripoli Haftar announces the beginning of Operation “Flood of Dignity” to “liberate” Tripoli from the control of armed militias. 2, 3, 4, 5, 6, 7 April 4 Sabratha, Surman, al-Aziziya, As Sabiriya, Zawiya, al-Zahra area LNA captures the towns of Surman, al-Aziziya, As Sabria, Zawiya, and the al-Zahra area from GNA-linked militias. 8 April 4 Wadi al-Hira The LNA announces that its forces clashed with forces led by the GNA-appointed commander of the Western Military Region, Usama al-Juweili, in Wadi al-Hira. 9 April 4 Tripoli International Airport LNA declares control over non-operational Tripoli International Airport. 10 April 4 Janzour neighborhood, Tripoli LNA forces take control of western Tripoli’s Janzour neighborhood. 11 April 4-5 Sidi Bilal Naval Base The LNA landed several of its naval vessels at the Sidi Bilal Naval Base, located just west of Tripoli’s Janzour neighborhood, during the overnight hours of April 4-5. April 4-5 Tripoli The Tripoli Protection Force (TPF) announces the launch of the second phase of Operation “Wadi al-Dom” against LNA forces during the overnight hours of April 4-5. 12 April 4-5 Gate 27, western entrance to Tripoli The TPF launched a counter-offensive against the LNA and was able to take back control of Gate 27, located at the western entrance to Tripoli. Gate 27 had been temporarily captured by LNA forces during the night hours of April 4. 13, 14, 15 April 5 Qasr Bin Ghashir, Wadi al-Rabee and Souq al-Khamis; Tripoli LNA seizes control of territory in Tripoli’s Qasr Bin Ghashir, Wadi al-Rabee, and Souq al-Khamis districts. April 6 Western Libya Libyan Air Force (LAF) declares western Libya a “no–fly zone” and indicates that any military aircraft including those “conducting aerial photography” but “excluding commercial flights” identified in the area will be considered as a “hostile target”. The LNA added that the aircraft’s point of departure will also be deemed a legitimate target. 16, 17, 18 April 6 Sadiya, Ain Zara, Khallet al-Furjan; Tripoli LNA makes multiple territorial gains in Tripoli’s Sadiya, Ain Zara, and Khallet al-Furjan districts. April 6 Wadi al-Rabee, Souq al-Khamis; Tripoli GNA conducts airstrikes against LNA positions in Tripoli’s Wadi al-Rabee and Souq al-Khamis districts. April 6 al-Aziziyah, Gharyan GNA conducts airstrikes against LNA positions in al-Aziziyah and Gharyan. April 7 Tripoli GNA announces launch of anti-LNA Operation “Volcano of Wrath”. April 7 Tripoli US Africa Command (AFRICOM) issues statement announcing the temporary relocation of a contingent of US troops supporting US AFRICOM due to the “security conditions on the ground”. 19 April 8 Mitiga International Airport LAF conducts airstrikes targeting the Mitiga International Airport. April 8 Tripoli International Airport GNA-linked militias reportedly take back control of the Tripoli International Airport from the LNA. 20 April 8 Yarmouk Refugee Camp 29 LNA soldiers surrender to GNA-linked forces in the Yarmouk Refugee Camp. April 8 Tripoli Italy begins to evacuate its troops from Tripoli. April 8-9 Tripoli UN Special Mission in Libya (UNSMIL) evacuates its staff from Tripoli. April 8 Tripoli GNA announces the closure of the air space over Tripoli. Misrata forces reportedly deploy air defense systems in the capital. 21 April 9 Salah al-Din District GNA-linked forces take control of several areas in Salah al-Din District after the withdrawal of LNA forces. April 9 Warshefana District LAF conducts airstrikes against GNA positions. April 9 Tripoli International Airport LAF conducts airstrikes against the GNA-held Tripoli International Airport. April 9 Ash Shwayrif LAF conducts airstrikes against fuel trucks in Ash Shwayrif. The trucks were reportedly en route to the LNA-held Gharyan. March 30 Libya held municipal elections in nine municipalities, which had a turnout of 40 percent of registered voters. March 31 GNA Prime Minister Fayez al-Serraj called on Arab countries to agree on Libyan crisis during 30th Arab summit in Tunis. March 31 A bilateral cooperation agreement was signed between the Atomic Energy Cooperation and The Libyan Center for Remote Sensing and Space Sciences. April 2 Reports indicated that trade between Libya and Algeria has faced hurdles over the past days in light of the continued closure of the border between the two countries. The latest developments in Tripoli come within the context of the LNA’s Operation “Flood of Dignity”, which is aimed at eliminating local militias operating within the capital, and the GNA’s counter-offensive, named Operation “Volcano of Wrath”, which is aimed at preventing the LNA from taking control of the city and its surrounding areas. The fact that the LNA managed to swiftly take control of several areas located west and south of the capital within a short span of time can be attributed to two main factors. First, the LNA had the advantage of surprise during the initial days of Operation “Flood of Dignity”. This allowed LNA forces to advance swiftly and take control of areas, such as Gharyan, Aziziyah, Surman, and Zawiya, without much resistance. This is particularly as this lack of time prevented the local militias who were in control of these towns to form any significant alliances to present a unified defense. Second, the local militias that were in control of the aforementioned towns are largely self-trained and lack the necessary resources required to withstand an offensive by the relatively better equipped and trained LNA troops. The LNA’s recent territorial gains against local militias in southern Libya likely prompted militias in northwestern Libya to concede territory to advancing LNA forces, in an effort to preserve the lives of their fighters and their respective cities’ infrastructure. 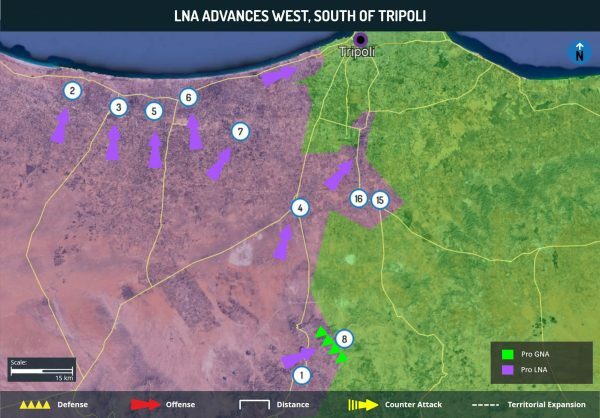 FORECAST: That said, while the LNA managed to make significant territorial gains within the first three days of the launch of Operation “Flood of Dignity” is not indicative of a similar positive momentum for LNA forces in the future. Areas within Tripoli are controlled by militias, such as the al-Radaa Deterrence Forces, the Tripoli Revolutionaries’ Brigade, and the Abu Salim Unit, which are unified under the umbrella organization of the Tripoli Protection Force (TPF). This will allow the TPF to present a stronger defense to advancing LNA forces, as already underlined by the fact that GNA-linked forces managed to reverse almost all the gains made by the LNA in the Qasr Bin Ghashir, Ain Zara, Salah al-Din, and Wadi al-Rabee districts on April 8-9. Moreover, recent reinforcements diverted by Misrata forces from Misrata towards Tripoli will allow the GNA to bolster its defenses within downtown Tripoli, further slowing down the LNA’s advances into the capital. Although, the LNA is likely to employ the use of heavy weaponry, such as tanks, mortar shelling, and airstrikes as cover for its ground troops, its forces are likely to refrain from making indiscriminate use of such a strategy as it will inevitably result in civilian collateral damage. A high civilian casualty count has the potential to significantly diminish Haftar’s increased international and national legitimacy. The IS-perpetrated attack in al-Fuqaha bolsters our previous assessment that Sunni jihadist militant groups operating in Libya will likely attempt to take advantage of the LNA and the GNA-linked forces’ preoccupation in fighting each other in northwestern Libya to conduct attacks and potentially attempt to take control of territory in other parts of the country. IS has conducted several attacks in the al-Fuqaha area in the past, with the most notable one occurring during the overnight hours of October 28-29, 2018. The Sunni jihadist militant group’s known operational presence in the areas surrounding al-Fuqaha likely allowed it to quickly mobilize its fighters in the aftermath of the outbreak of hostilities near Tripoli and launch the latest attack. This is supported by the relatively low-scale of the attack, which indicates that it was likely planned and executed within a short span of time. FORECAST: The LNA will likely divert at least some troops and resources towards al-Fuqaha over the coming days in order to secure the town. These troops will likely be diverted from fronts other than Tripoli, in an effort to prevent the down-scaling of Operation “Flood of Dignity”. However, such a scenario is liable to leave other parts of eastern and southern Libya vulnerable to IS operations. Overall, the Sunni jihadist militant group will attempt to increase the frequency, symbolism, and scale of its attacks in Libya over the coming days and weeks. It is advised to defer all travel to Tripoli and Benghazi at this time due to a recent uptick in violence, threats against foreigners, and the risk of a broad deterioration of security conditions. We advise at this time that those remaining in Tripoli and Benghazi should initiate contingency and emergency evacuation plans due to deterioration in the security situation. Contact us at [email protected] or +44 20-3540-0434 for itinerary and contingency support plans. For those remaining in Tripoli, we advise to avoid nonessential travel to the outskirts of the city, particularly the Janzour and Tajoura neighborhoods, as well as to the Mitiga and Tripoli International Airports, given that these are the focal points of ground clashes and airstrikes in the city. Travel to Misrata and Tobruk should be for essential purposes only, while adhering to all security precautions regarding civil unrest and militancy. We advise against all travel to outlying areas of the country, due to the threat of militancy, kidnapping, and general lawlessness in such areas. Avoid entering Libyan territorial waters in the area between Benghazi and al-Tamimi without prior authorization, as a “no-sail zone” is currently in effect in this area and several naval vessels had been intercepted or attacked due to not following proper procedures. Those planning to conduct air travel to, from and inside Libya should avoid entering the area between Marsa al-Brega, Sirte and Sebha, as it was declared a no-fly zone by the Libyan National Army (LNA). We further advise against all travel to Libya’s border areas at this time due to persistent violence and lawlessness in these regions. The modus operandi of the November 23 attack against the Tazirbu police station is very similar to the October 28-29 Islamic State (IS)-claimed attack against a police station in al-Fuqaha, Jufra District. The scale of these attacks, combined with the short time span within which they occurred make them highly noteworthy. This shift in IS strategy from localized small-scale attacks across Libyan territory towards more focused large-scale attacks against towns in southern Libya, which witness lower security presence, indicates that the militant group has to some degree managed to reinforce its ranks as well as rebuild its capabilities over the past year. Similar to the al-Fuqaha attack, IS militants kidnapped ten people, including government officials and security personnel from Tazirbu. IS’ increased focus on kidnappings can be attributed to its interest in using the abductees as bargaining chips for ransom. This would allow the group to replenish its revenues, purchase supplies and weaponry, and ramp up its operations in Libya. We advised against all travel to the southern outlying areas of Libya at this time due to the general lack of governance and security protocols in this region, which makes it conducive for militant activity and attractive targets for attacks. 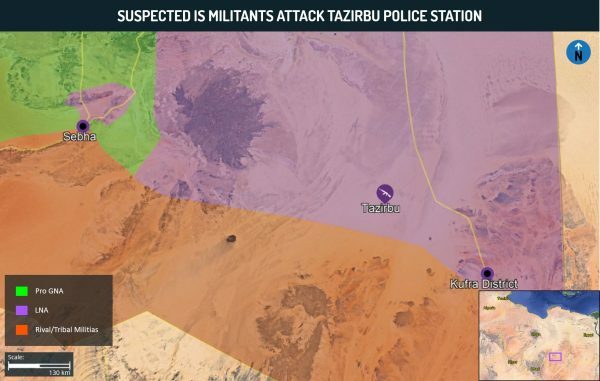 According to reports, suspected IS militants aboard ten armed vehicles launched an attack targeting a police station in Tazirbu, located in the Kufra District, during the night hours of November 23. At least nine civilians and policemen were killed, and 15 were wounded as a result of the attack. Reports further indicate that the militants kidnapped at least ten people, including the Mayor of Tazirbu and a member of the municipal council, and fled the scene. The Libyan National Army (LNA) has diverted forces from other parts of Kufra District towards the town of Tazirbu to secure it. The modus operandi, target, and location of the attack suggest that it was carried out by IS militants. The Sunni jihadist militant group recently conducted a very similar attack against the al-Fuqaha police station, located in the Jufra District, during the overnight hours of October 28-29. The scale of these two attacks, along with the short time span within which they occured make them highly noteworthy. In the time period between IS’ complete loss of territories in Libya in December 2016 and October 2018, the majority of the militant group’s attacks had been relatively small-scale as well as spread out over a long period of time and territory. The majority of these attacks utilized suicide vehicle-borne IEDs (SVBIEDs) against security checkpoints or small-scale raids against police stations. For instance, the July 24 raid against the al-Uqaylah police station killed two LNA soldiers and wounded three others, while the June 2 raid against the al-Qunan police station killed one civilian and wounded five others. Over the past year, IS was likely operating in groups of 10-12 fighters in the country. This allowed its militants to avoid attracting security forces’ attention and move relatively undetected across a larger swathe of territory. The lack of sufficient personnel and weaponry may have compelled IS to operate in this manner, which, in turn, had an impact upon their ability to launch larger-scale attacks. The recent attacks in al-Fuqaha and Tazirbu may indicate that IS has managed to bolster its ranks, partly through militants fleeing the group’s territorial losses in Syria and Iraq and partly through new recruits who now consider Libya as a more attractive arena. This has allowed IS to concentrate its forces towards launching larger-scale attacks against entire towns, rather than just security checkpoints or isolated government infrastructure, for example, in Tripoli in May and September as well as in Misrata in October 2017. While, on the one hand, this indicates that IS has managed to rebuild its capabilities in Libya to some degree since its loss of territories to Misrata forces in December 2016, the location of the recent attacks suggest that these capabilities are still limited. Although al-Fuqaha and Tazirbu are both located within LNA-held territories, the towns witness relatively lower security presence as compared to areas located further north in the Sirte Basin and the Oil Crescent. The security forces of southern towns are largely comprised of local militias, who maintain small armed fighting units that are neither well-equipped nor well-trained. Therefore, it is possible that IS decided to focus its efforts in southern Libya, as this would increase the militant group’s chances of success. As witnessed in the attack on the al-Fuqaha police station, the focus on conducting kidnapping of government officials and security forces stands out in the recent incident. Unconfirmed reports from November 10 indicated that IS is seeking to negotiate the release of four out of the ten hostages abducted in the attack on al-Fuqaha. If confirmed, this would suggest that through such kidnappings-for-ransom, the Sunni jihadist militant group is aiming to replenish its revenues, which, in turn, would allow it to purchase supplies and weaponry to ramp up its operations in Libya. This would also explain the recent kidnapping of the Mayor of Tazirbu, who by the prerogative of his position within society would demand a higher ransom. Aside from the ransom, such an abduction allows IS to project the Libyan authorities as incapable of securing its own civilians, thereby allowing the group to showcase its relatively higher capabilities. FORECAST: IS will claim responsibility for the attack over the coming hours, as its scale will allow the militant group to significantly raise its profile in Libya. Meanwhile, the LNA will divert forces towards Tazirbu in order to secure the town over the coming hours and days. It will increase security protocols in Kufra District, which may include increased security checkpoints along main roads. The LNA may also tighten security along Libya’s southern borders with Sudan and Chad, as the porosity of these borders allows militant organizations to engage in the cross-border movement of fighters, supplies, and weaponry. While this may facilitate LNA forces in gathering vital intelligence and intercepting IS convoys, it will also provide the militant group with additional targets for attacks. On a more strategic level, the UN-backed Government of National Accord (GNA) may utilize this attack to highlight the LNA’s inability to secure its held territories and attempt to leverage this in its political negotiations with the latter. It is advised to defer all travel to Tripoli and Benghazi at this time due to ongoing violence, threats against foreigners, and the risk of a broad deterioration of security conditions. We advise at this time that those remaining in Tripoli and Benghazi should initiate contingency and emergency evacuation plans due to deterioration in the security situation. Contact us at [email protected] or +44 20-3540-0434 for itinerary and contingency support plans. For those remaining in Tripoli, we advise to avoid nonessential travel to the outskirts of the city, particularly the Janzour and Tajoura neighborhoods, as well as to the Mitiga and Tripoli International Airports, given that these are focal points of ground clashes in the city. 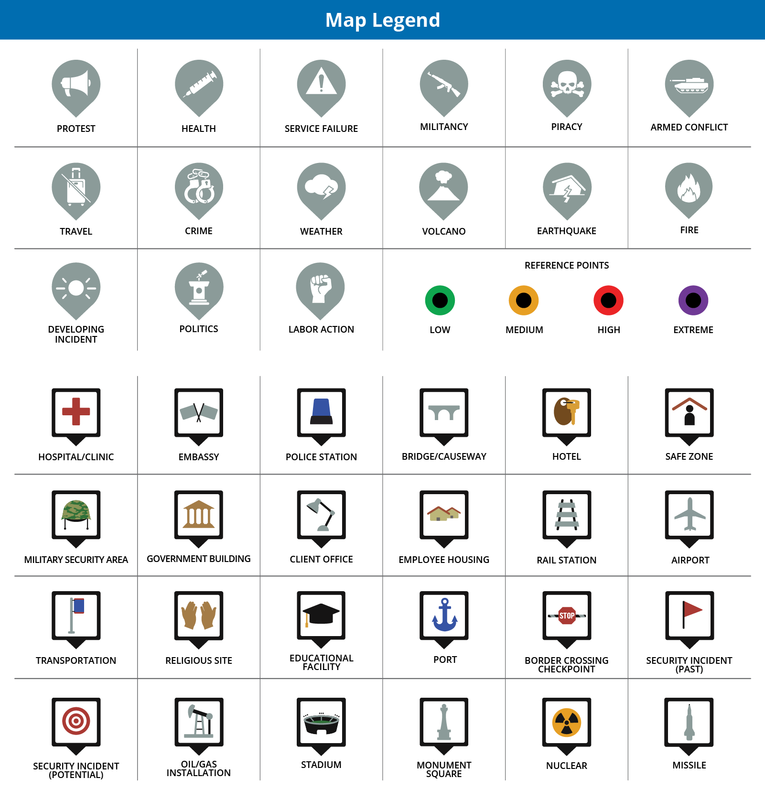 Avoid the immediate vicinity of government buildings, police stations, media outlet offices, and political party and militia headquarters, given that these locales have been targeted by militia groups in the past and recently by militants, and thus remain at increased risk for violence and unrest. Westerners, particularly US citizens, operating in Libya are advised to maintain a low profile and exercise heightened vigilance in light of prevailing anti-Western sentiment and increasing attacks against foreigners. Nationwide, take precautions to mitigate the risk of being targeted for kidnapping. Refrain from traveling in luxury vehicles and maintain a generally low profile. Routinely alter travel routes and refrain from divulging sensitive itinerary information to strangers. According to the Ministry of Interior (MoI), a group of militants killed six National Guardsmen in an ambush targeting two vehicles patrolling the Tunisian-Algerian border near Ain Soltane village, located in Jendouba Governorate’s Ghardimaou District, during the morning hours of July 8. The militants reportedly detonated an IED against the patrol, which was then followed by gunfire against the National Guardsmen. The assailants reportedly fled the scene following the attack and are still at large. The attack was later claimed by al-Qaeda in the Islamic Maghreb (AQIM)-affiliated Okba Ibn Nafaa Brigade (OIB). According to their statement, nine National Guardsmen, including an officer, were killed in the attack. The militants seized eight rifles, a handgun, and a machine gun before fleeing the scene of the attack. According to reports, a man was arrested in Kairouan Governorate for expressing support for the AQIM-OIB claimed attack on July 9. In addition, members of the security services of Beja staged a protest in front of the National Guard’s headquarters demanding that the Minister of Interior (MoI) support new legislation meant to protect servicemen on July 9. The attack is highly notable since it is the largest militant attack on Tunisian soil since March 2016, when Islamic State (IS) militants infiltrated Medenine Governorate’s Ben Guerdane from Libya. This incident highlights the increased risk of militancy near Tunisia’s western borders with Algeria, with the latest attack in the area recorded on May 31, when security forces foiled an AQIM-OIB attack in Kasserine Governorate. Although, AQIM-OIB is known to maintain an operational base along the Tunisian-Algerian border, the majority of its attacks over the past year have been mainly focused in the southwest, namely Kasserine Governorate, rather than in Jendouba, which is located in the northwestern part of the country. Furthermore, all of these attacks have been of a lower sophistication, mainly involving the use of landmines or shootings. However, the latest attack utilized a relatively more sophisticated modus operandi. The multi-pronged nature of attack highlights the militant group’s resilience to security forces’ ongoing operations in western Tunisia, as well as their fighters’ abilities to regroup in the aftermath of such operations. It is also indicative of their ability to plan and execute coordinated attacks in order to achieve maximum casualties. The timing of the attack is further significant. It was likely conducted in response to several developments that undermine the group’s interests in the area. These developments include the recent heightened security protocols put in place by Tunisian security forces along the border area in coordination with their Algerian counterparts. This has led to a decline in the militant group’s abilities to operate along the border area, as witnessed in February, when Tunisian security forces neutralized a leader of AQIM-OIB in Kasserine Governorate based on intelligence from the Algerian intelligence apparatus. The militant had reportedly been sent from Algeria to reorganize the Tunisian affiliate. Security protocols along the western border have also hindered smuggling operations, which provide militant groups with supplies and revenue, and cement their codependence with local smugglers, as the latter also depends on these operations as a source of income. Mitigating these operations not only damages the militant group’s supply lines, but also erodes their influence over the local population, as its members inevitably seek other sources of income. Therefore, the attack likely seeks to compel security forces to divert resources away from Kasserine Governorate, which is AQIM-OIB’s primary area of operations in the country, towards Jendouba Governorate. This will overstretch the resources at the disposal of the Tunisian security apparatus, thus allowing militants to operate more freely in the area. The latest attack follows the June 3 IS-claimed attack against a gas pipeline near Kasserine Governorate’s Sbeitla. In light of the ongoing competition between IS and AQIM over weapons, supplies, and personnel in western Tunisia, it is highly likely that the latest attack was meant to be symbolic in nature. This would project AQIM-OIB as the more prominent Sunni jihadist group in the country, allowing it to attract supporters and recruits at the expense of IS. 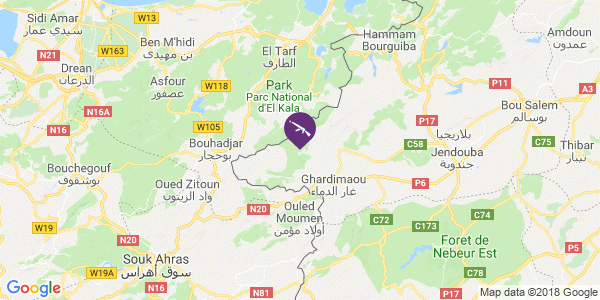 FORECAST: In response, the Tunisian Armed Forces (TAF) will launch intensified counter-militancy operations in western Tunisia, including in Jendouba, Kef, and Kasserine governorates. These will likely include increased security patrols as well as artillery shelling against potential militant hideouts in the mountainous regions. Security protocols will also be elevated along the Algerian border in order to prevent militants from crossing into Algeria and evading arrests. However, this increase in security presence may provide militants with additional targets, leading to further clashes between security personnel and militants. Moreover, the increase in AQIM-OIB activity may prompt IS to heighten operations in the country in the near term. Overall, given the continued entrenchment of militants in western Tunisia’s mountainous areas due to their demonstrated ability to adapt and evolve, further similar sporadic attacks are likely to take place in the coming weeks and months. Travel to Tunis may continue while adhering to all security precautions regarding militancy and civil unrest. Those operating or residing in Tunisia are advised that we maintain operational capabilities in the country. Contact us at [email protected] or +44 20-3540-0434 for itinerary and contingency support options. Those operating or residing in Jendouba District on July 8 should avoid all travel to the Ghardimaou District in light of the anticipated counter-militancy operations following the attack, as well as the likelihood for further clashes in the area over the coming days. Avoid all travel to the Kasserine, Kef, and Jendouba Governorates, in addition to all border areas, due to jihadist activity and military closures. Furthermore, avoid all travel to within 50 km from the border with Libya, due to the increased threat of attacks originating from Libya targeting Tunisian interests. 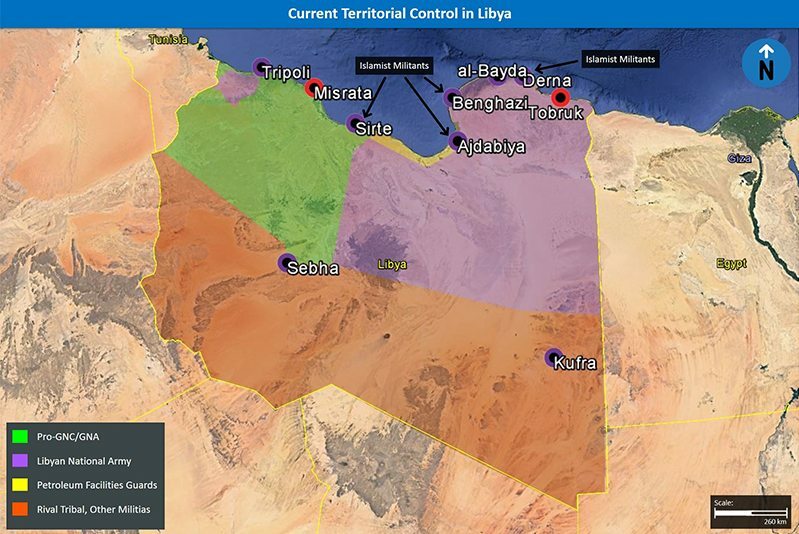 The June 14 attack against the Oil Crescent is highly notable as the Libyan National Army’s (LNA) control over this area has remained largely unchallenged since March 2017. The LNA’s preoccupation in hostilities in other parts of the country over the past year, combined with widespread cross-border smuggling of weapons and fighters across Libya’s southern borders likely allowed SDB fighters to regroup in southern Libya. The timing of the latest attack is significant as it attempted to capitalize upon the LNA’s preoccupation in ongoing operations in Derna, aimed at dislodging the al-Qaeda-linked Derna Protection Force (DPF) from the city. Ibrahim al-Jathran’s mentioning of the UN-backed Government of National Accord (GNA) as the country’s only “legitimate” government in his statement is likely deliberate and part of an effort by al-Jathran to gain legitimacy for the attack. Although the LNA was able to successfully repel the attack, it will likely divert further troops to the area over the coming hours and days to fortify all the installations in the Oil Crescent. Those conducting business at the Ras Lanuf and Sidra oil terminals are advised to compensate for anticipated delays in operations on June 15 and over the coming days due to the closure of the facilities. During the morning hours of June 14, an armed group led by Ibrahim al-Jathran, a former commander of the UN-backed Government of National Accord (GNA)-linked Petroleum Facilities Guard (PFG), attacked the Sidra and Ras Lanuf oil fields in the Oil Crescent. According to a video released by al-Jathran, the attack was supported by the Magharba tribe and the Tebu militia. 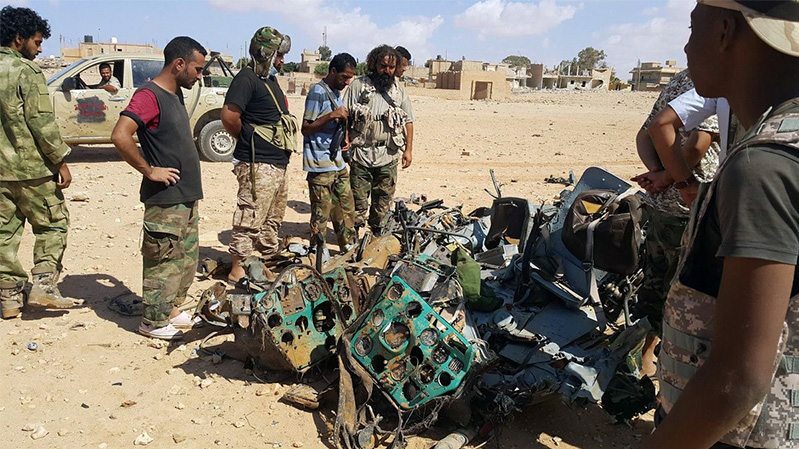 According to the Libyan National Army (LNA), the al-Qaeda-linked Saraya Defend Benghazi (SDB) was behind the attack. The LNA confirmed that the group of SDB fighters were led by al-Jathran. Further unconfirmed reports also indicate the involvement of armed groups from Chad. Al-Jathran claimed that the attack was aimed at freeing the region from the ‘‘terrorist and extremist’’ LNA forces in an effort to end the ‘‘injustice’’ in the oil crescent. He further stated that the GNA has sole legitimacy in the country. The GNA released a statement saying that it had not authorized any military action in the OIl Crescent and condemned the attack as a “terrorist operation”. The LNA has diverted troops and aircraft to the area to repel the attack. Furthermore, the Libyan Air Force (LAF) has launched multiple airstrikes against the armed group over the past 24 hours. The LNA claims that the oil ports are under the control of its forces and that the attack was successfully repelled. At least four LNA soldiers have been killed as a result of the clashes. However, unconfirmed reports indicate that the clashes are still ongoing and that the armed group has taken control of the Ras Lanuf and Sidra oil terminals. The National Oil Corporation (NOC) has declared “force majeure” at both oil fields and evacuated all workers out of the area. This development is highly notable as the LNA’s control over the Oil Crescent has remained largely unchallenged since March 2017, when LNA forces launched a counter-offensive against the SDB and the PFG, who had temporarily taken control of the Ras Lanuf and Sidra oil terminals. The LNA initially took control of the Oil Crescent from the PFG in an attack against the group in December 2016, after the SDB officially handed over control of the oil terminals to the GNA-linked forces. Meanwhile, although the SDB indicated its willingness to disband in June 2017 after its substantial losses against the LNA in the Jufra District, the large-scale nature of this attack indicates that the militant group has successfully managed to regroup and regain at least part of its capabilities over the past year. This bolsters our previous assessment that SDB fighters will likely disperse to more remote areas in the latter half of 2017 to regroup. Several factors likely facilitated the resurgence of the SDB at this time. Firstly, the LNA’s preoccupation in hostilities in other parts of the country, such as in the Warshefana District, Benghazi, Sebha, Derna, and the Sirte Basin, over the past year likely allowed SDB fighters to regroup in southern Libya, which remains largely controlled by tribal militias and is out of the jurisdiction of both the LNA and the GNA, without being detected by security forces. Secondly, widespread cross-border smuggling of weapons and fighters across LIbya’s southern borders with Sudan and Chad, likely allowed the militant group to reinforce its offensive capabilities. Thirdly, reports regarding LNA Field Marshal Khalifa Haftar’s ill health in April may have bolstered the morale of SDB fighters, enabling the group to further ramp up its operations. All of these factors combined allowed the militant group to launch its first attack in over a year on May 31 against the LAF-controlled Tamanhint Airbase, and temporarily take control of the facility. The timing of the latest attack is significant as it comes amid the LNA’s ongoing operations in Derna, aimed at dislodging the al-Qaeda-linked Derna Protection Force (DPF) from the city. Therefore, the armed group was likely attempting to capitalize upon the fact that LNA forces currently remain overstretched across eastern Libya, which increases the possibility of success of an attack against the Oil Crescent at this time. This attack serves the aims of both former PFG members as well as the SDB. If successful, the attack would provide both groups with vast resources. They would be able to sell the oil from the production facilities on the black market and fund their operations in Libya. That said, even if the attack was not successful, it would elevate al-Jathran’s status in the country and bring the commander back to light after a two year hiatus. With regards to the SDB, such an attack would deprive the LNA of vital revenue from oil exports. It would also compel the LNA to divert troops and resources away from their ongoing operations in Derna, thus, providing at least partial relief to the al-Qaeda-linked DPF in the city. Furthermore, al-Jathran’s statement is notable as it specifically mentions the UN-backed GNA, calling it the country’s “legitimate” government. This was likely deliberate and part of an effort by al-Jathran to gain legitimacy for the attack. This underscores a larger trend in Libya, wherein various armed actors in the country utilize the lack of a sovereign political authority for their own gains. This lack of a unified government has created ambiguity in territorial jurisdiction, allowing various armed groups to proliferate and operate along the fringes. This not only highlights Libya’s volatile political environment but also the threat posed by it to vital infrastructure located in the country. However, the fact that the LNA was able to recapture the oil terminals within the span of a day highlights its relative capabilities to defend the oil infrastructure from such armed assaults. FORECAST: Although the LNA was able to successfully repel the attack, it will likely divert further troops to the area over the coming hours and days to fortify all the installations in the Oil Crescent. Furthermore, LNA forces will launch security raids in areas surrounding the Ras Lanuf and Sidra oil terminals to hinder the ability of SDB fighters to receive reinforcements from other parts of Libya and mount another similar attack. The LAF will also increase aerial reconnaissance over the Sirte Basin and launch airstrikes against suspected armed convoys belonging to militant groups. It is also possible that foreign aircraft, such as those of the US, will launch airstrikes against militants in the Sirte Basin over the coming days in an effort to secure their interests in the country. This is light of the fact that the UN-backed GNA has denounced the latest attack as a militant operation and this will increase the US’s concerns regarding the growing threat of militancy in Libya. Aerial operations by LNA-allies, such as UAE and Egypt, may also be witnessed over eastern Libya over the coming days. That said, the LNA’s increased preoccupation in the Oil Crescent may slow down its ground offensive against the DPF in Derna in the short-term. For those operating in or conducting business with oil facilities, it is advised to consult with us for itinerary-based travel recommendations and ground support options. During the overnight hours of May 8-9, al-Qaeda in the Islamic Maghreb (AQIM) issued a threat against Western, and particularly French, companies that operate in the area “from Libya to Mauritania”. While the threat is not new but rather a reiteration of an existing and proven one, its release in the lead-up to the holy month of Ramadan is indication of a heightened risk of al-Qaeda attacks against Western companies and interests in North Africa and the Sahel region over the coming weeks. During the overnight hours of May 8-9, the al-Andalus Foundation, the media wing of al-Qaeda in the Islamic Maghreb (AQIM), published a “Statement for French and Western Companies”. In the statement, AQIM threatens to attack Western, and particularly French, companies that operate in the area “from Libya to Mauritania”. The publication further states that “85 percent of the wealth in this region is controlled by the French, while the rest is in the hands of traitors” and that the “French occupation prevents the prosperity of the region and has corrupted society”. The statement concluded by warning Muslims to stay away from Western companies’ sites for fear of being hurt by collateral damage in an attack. AQIM’s statement does not denote a new threat to Western operations and presence in Africa, but is rather a reiteration of its main strategy: driving Western influence away from what AQIM perceive as their areas of influence, with the intention of consolidating its control and later expanding it while facing diminished resistance. AQIM and organizations that are directly affiliated with it, such as Jamaat Nusratal-Islam Wal Muslimeen (JNIM), have conducted several high profile attacks as part of this strategy. These most notably include the March 2 attack against the French Embassy in Ouagadougou, Burkina Faso; the October 25, 2017 attack against a French firm in Soumpi, Mali; and the March 18, 2016 attack against the Krechba gas facility in Algeria that was jointly operated by an Algerian government-owned company, and Norwegian- and British-based companies. This strategy is also the main reason for AQIM’s threat particularly addressing French companies, as the French-led “Operation Barkhane” in the Sahel in support of the G5 countries (Burkina Faso, Chad, Mali, Mauritania, and Niger) is currently the main threat to AQIM and its direct affiliates’ operations. This threat was recently exemplified by French operations on February 14 in Mali that resulted in the deaths of six JNIM leaders, including that of Hasan al-Ansari, co-founder of JNIM, later confirmed by the group itself. 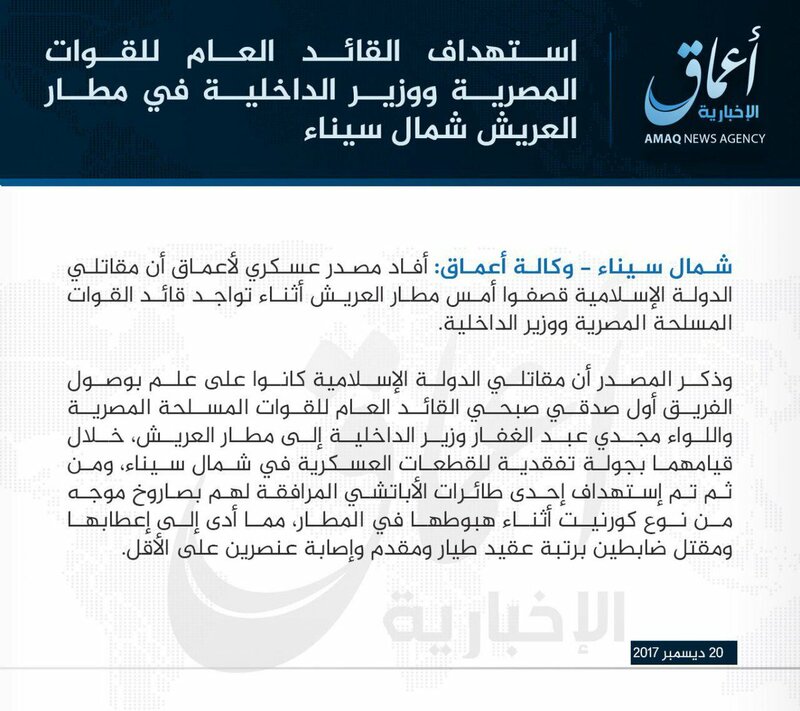 However, as noted in AQIM’s latest statement, the threat extends to all Western companies, all perceived as “crusaders” in AQIM’s narrative, which it would attack given the opportunity, as underscored by the March 2016 Krechba attack that targeted Algerian, Norwegian, and British firms. That most of the attacks thus far have been directed against French interests is largely due to the outsized French presence among potential targets in the region and France’s lead role in regional counter-militancy operations. The references made to the negative impact of the French presence on the region’s economy and society underscores an inherent part of al-Qaeda’s strategy as a whole, and that of AQIM in particular. AQIM, unlike certain other jihadist groups such as the Islamic State (IS), is willing to be more flexible in the implementation of its religious ideology in order to not only gain the support of, but also embed themselves in the local population. Thus, by appealing to material interests such as the state of the economy and society, AQIM is seeking to create an image of “us against them”, rallying as much of the local population as possible in opposition to foreign influence. While this may boost recruitment for the group, this is not the main goal in this case, as al-Qaeda favors quality over quantity with its fighters. The goal is rather to enhance the group’s freedom of operation within the population, which it will utilize to launch attacks and, later, to go into hiding as well as to facilitate logistical support. FORECAST: Currently, AQIM and its direct affiliates maintain a presence, either of offensive operations or for logistical support, in parts of Algeria, Tunisia, Libya, Mauritania, Mali, Burkina Faso, and Niger, putting these countries at a high risk, which also corresponds with the message threatening Western companies “from Libya to Mauritania”. Given the current strategy and deployment of the group, as well as precedent, we assess that of these countries Algeria, Mali, and Burkina Faso are at the highest risk. Nonetheless, this foothold could, depending on developments and the dynamics of the situation in the region, be exploited to launch attacks into neighboring countries if needed. FORECAST: It is important to note that while AQIM’s threat is not new, but rather a reiteration of an existing and proven threat, it does come ahead of the holy month of Ramadan, currently slated to start on May 15. This period of the year historically is when jihadist groups attempt to increase their rate of operations and conduct more high profile and notable attacks, so as to capitalize on the symbolism of the holiday. Accordingly, it is possible that the timing of AQIM’s latest message was similarly motivated, thus highlighting the elevated potential for al-Qaeda attacks against Western interests in North Africa and the Sahel region over the coming weeks. Western companies operating in the North Africa and Sahel regions are advised to evaluate security procedures pertaining to attacks against installations, and emphasize guideline to their staff. Examine behavioral patterns of local employees on site to mitigate potential risks arising from influence by Jihadist propaganda. Monitor MAX Intelligence’s reports, as well as local publications to remain abreast of the dynamics of the threat posed by Jihadist groups in your areas of operations. Potential indications of a change in the level of threat include the rate, scope and rhetoric of Jihadist publications and their attacks, changes in modus operandi, scale and sophistication of attacks, and changes to areas of operations and influence of different groups. 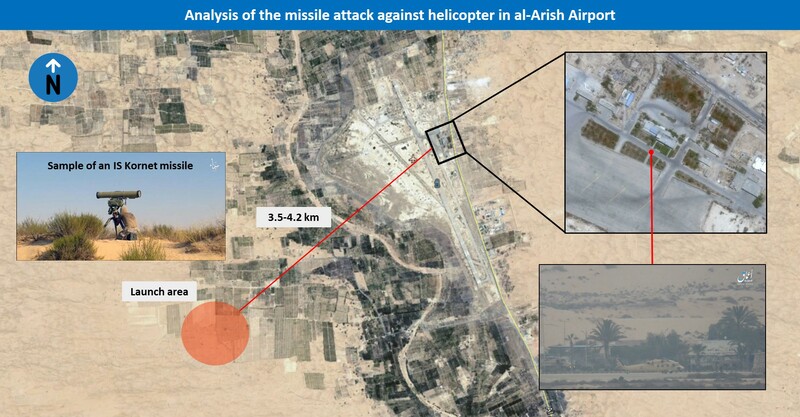 On December 20, an anti-tank guided missile (ATGM) targeted a helicopter on the ramp of al-Arish Airport, located in Egypt’s North Sinai Governorate. The helicopter carried, among others, the Egyptian interior and defense ministers who disembarked from the aircraft shortly before the attack. On December 21, the Islamic State (IS)-linked news agency released a report on the attack, alongside a claim of responsibility by the local IS affiliate Wilayat Sinai, stating that the group had prior knowledge of the arrival of the ministers and dispatched a team of militants to ambush the entourage. It further stated that the attack was conducted with the use of a 9M133 “Kornet” ATGM that targeted an AH-64 Apache attack helicopter that was escorting the VIPs. Later that day, the IS-linked news agency released a video showing the attack itself, in which the ministers and their entourage can be seen next to the helicopter with its navigation lights still on, which contrary to initial publications was a UH-60 “Blackhawk”, as it was hit by an ATGM. 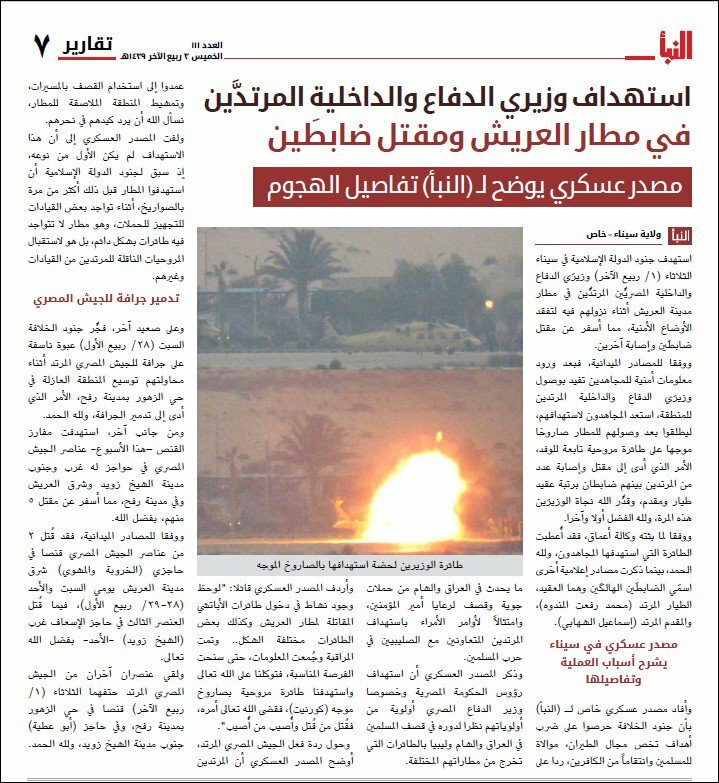 Edition number 111 of IS’s weekly al-Naba newsletter published on December 22 included a more detailed and contradictory account of the attack, stating that militants spotted a helicopter with a “unique shape” and concluded that this would be a high value target. This prompted militants to dispatch an ATGM team to a position overlooking the airport with the objective of destroying the “unique aircraft”. It is important to mention that the Egyptian Air Force (EAAF) reportedly operated two Blackhawk helicopters prior to the attack, mainly in the role of VIP transport. These aircraft are much more distinct than others that would commonly be seen in Sinai’s airspace, such as Apaches or Mi-17s. While there has been no corroboration as to the type of missile used by IS in the attack at the time of writing, Wilayat Sinai have employed Kornets several times in the past, most notably in July 2015 when the group used the missile to attack an Egyptian naval vessel off the coast of North Sinai’s Rafah. If the missile used was in fact a Kornet as IS claims, given that the missile was in flight for 14 seconds from launch until it hit its target and given that the speed of a standard Kornet missile is between 250 and 300 meters a second, it would place the launcher between 3.5 and 4.2 km from the target, well within the Kornet’s effective daytime range. The attack does not represent a precedent, but rather serves as an opportunity to highlight the threat posed to aviation from the proliferation of ATGMs in the hands of numerous militant groups in multiple countries. Several accounts of ATGMs being fired against aircraft were recorded in recent years, including successfully targeting aircraft in flight, with the most prominent example being the downing of an Israeli Air Force (IAF) helicopter by Hezbollah in Lebanon on August 12, 2006. This is especially important as this threat is often overlooked in comparison to the more well known threat posed by man-portable air defense systems (MANPADS). While MANPADS pose a more prominent threat to aircraft, as they were designed with the specific goal of targeting aircraft, they have several shortcomings compared to ATGMs. These mainly include being more delicate, having parts with short shelf lives, requiring greater expertise and training to successfully operate, and being more rare. ATGMs still require expertise and training, although less than MANPADS, and are generally more durable and can be sustained for operations over longer time and in harsher conditions. Most importantly however, ATGMs are significantly more common than MANPADS, and with the destabilization of countries such as Libya, Syria, Iraq, and Yemen, thousands of these systems, of different generations and capabilities, were taken away from military storage and ended in the hands of militant groups across the world. This is in addition to illegal purchases through stable countries that do not adhere to international norms, such as Belarus and North Korea. As noted, ATGMs were not designed primarily to hit aircraft and therefore do not excel in it, however, the features for which they were designed, namely attacking a comparatively slow moving target, still make them effective weapons against aircraft. This is mostly relevant during the takeoff and landing stages of both rotary and fixed-wing aircraft, when these are most vulnerable due to their low speed and altitude. In addition, while there are several options of countermeasures against MANPADS that can be used by civil aircraft, countermeasures against ATGMs are fewer, and often involve explosives, making them currently non-optional for civil aircraft. An additional weakness exposed in the recent attack is the dependency on local security forces and their protocols, which can often be low in standard. The attack occurred in a region currently undergoing prolonged and high intensity militant activity, in a city that was hit by the most attacks in the region in recent months. Despite this fact, the VIPs were flown in a distinct helicopter that draws attention, the airport lacks even basic and cheap means in place that may disrupt or prevent a missile attack, such as walls that would block line of sight into the airport, or metal nets that would negate the missile’s shaped charge mechanism. All of these expose the weaknesses of local security protocols, which were a direct factor in the attack. The threat of ATGMs should be considered as a potential factor while conducting risk and vulnerability surveys, particularly in unstable regions. Prior to conducting aerial activity in countries with known militant activity, contact us at [email protected] to consult on the possible threat posed by relevant militant groups’ weapons and capabilities and ways to mitigate these. Contact us at [email protected] or +44 20-3540-0434 for security surveys of airports. During the morning hours of June 5, Saudi Arabia, Bahrain, Egypt, and the UAE announced the cutting of all diplomatic ties with Qatar. The Hadi-led government in Yemen, as well as Libya’s anti-Islamist House of Representatives (HoR) similarly announced the severing of diplomatic ties with Qatar on the same day. The first four countries issued a 48-hour ultimatum to Qatari diplomats to evacuate their respective nations, while similarly issuing an ultimatum to all other Qatari citizens to leave within two weeks. 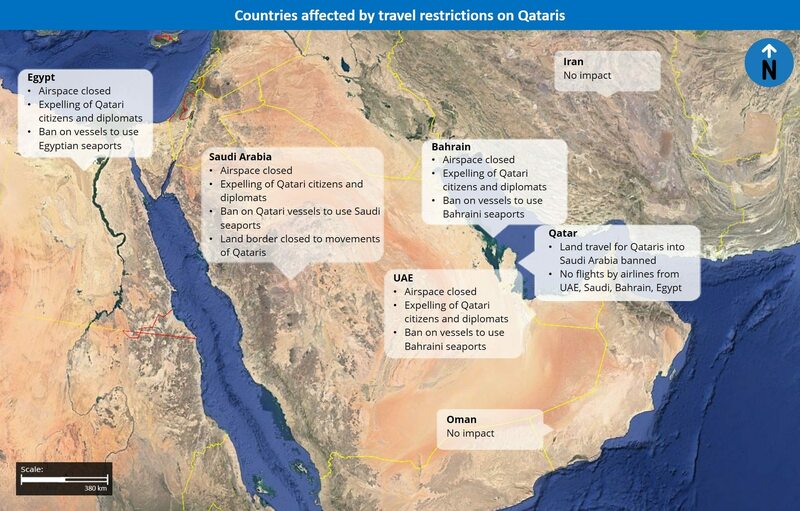 Additionally, Saudi Arabia, Bahrain, Egypt, and the UAE announced that they had closed their airspace for Qatari aircrafts, and that all flights by airliners from these countries to Qatar were suspended. Qatari naval vessels will also not be allowed to use the countries’ seaports to anchor, while land travel between Qatar and Saudi Arabia will be limited to non-Qatari nationals only. Additional measures implemented against Qatar include the expelling of the country from the Saudi-led coalition in Yemen and its anti-Islamic State (IS) coalition in Syria. These measures were implemented based on accusations that Qatar is “supporting and financing extremist groups” across the region, as well as encouraging sectarianism and subversive elements operating in the abovementioned countries. Meanwhile, Qatar’s Ministry of Foreign Affairs issued a statement that the accusations are “absolute fabrications” and “proves that there are premeditated intentions to cause damage to Qatar”. While the new development is unlikely to have any effect on Qatar’s and any of the other impacted countries’ security conditions in the short term, we assess that this measure may lead to multiple local and regional ramifications over the coming months. For instance, approximately 90 percent of Qatar’s imports of food products are transferred through land from Saudi Arabia. Thus, in light of the border closure between the two countries, Doha will likely be forced to divert a large amount of resources in developing its maritime trade, including in the form of improving its seaport infrastructure, as now its imports via sea are liable to be enhanced significantly. Moreover, given the high-profile nature of the event, there remains a possibility that the turn of events will impact global markets, and particularly the oil sector, as it may be perceived as a source of instability across this oil-rich region. These new developments may also impact expatriates, including Westerners operating in Qatar and the GCC, particularly given the suspension of flights between the GCC countries and Qatar and the closure of the land border with Saudi Arabia. In light of the likely increase in logistical difficulties in traveling between Qatar and the above-mentioned countries, exacted upon expatriates by the measures, it is likely to damage Qatar’s national economy. Though the impact on GCC residents seeking to enter Qatar is yet to be determined, it cannot be ruled out that Qatar will implement punitive measures and ban GCC citizens and residents from entering the country. The partial isolation of Qatar may affect several conflicts and political rivalries across the region. With regards to Iran, Doha is liable to improve its bilateral relations and economic ties with Tehran, as now Qatar would be compelled to compensate for its political and economic setback. Moreover, in Yemen, in the short-term, Qatar’s absence from the Saudi-led coalition may slightly reduce the latter’s on-the-ground capabilities in fighting against the Iranian-backed Shiite Houthis. However, given Qatar’s already limited role in the coalition, as well as the aforementioned arms deal with the US, in the medium to long-term the Saudi-led coalitions is unlikely to be significantly impacted by Qatar’s absence from the coalition. In Syria, in light of the already heightened internal divisions between rebel factions, it remains possible that this new development will further exacerbate tensions between rebel groups supported by Qatar on one side, and factions backed by Saudi Arabia and the UAE on the other. Should the event indeed lead to an economic recession in Qatar, their supported factions on-the ground would suffer from a shortage of resources, thus forcing them to disband or merge into other factions. With this in mind, should scenarios eventually materialize, it would potentially tip the scale towards the pro-government forces in the Syrian conflict. In Libya, the development may constitute a boost to the HoR and its allied Libyan National Army (LNA), given their conflict with the pro-Islamist General National Congress (GNC) and its affiliated militias, which are partially supported by Qatar. That said, Qatar’s direct involvement in this conflict has significantly waned in recent years, particularly since the March 2016 arrival of the UN-backed Government of National Accord (GNA) to the designated capital of Tripoli, and therefore any implications on the conflict will remain limited. Today’s development comes amidst years of tensions between Saudi Arabia, Bahrain, UAE, and Egypt on one side, and Qatar on the other, surrounding multiple issues, chiefly the latter’s alleged direct involvement in the internal affairs of countries throughout the region. This is particularly relevant to Qatar’s long-standing support for Muslim Brotherhood-linked political elements across the Middle East and North Africa, as the countries in this Saudi-led alliance view the Islamist organization is a subversive element and a threat to their respective governments. Additional contentious issue include Qatar’s overall positive relations with Iran, as opposed to that of the other Gulf Cooperation Countries (GCC), with the exception of Oman, which remain strong adversaries of Tehran. This is highlighted by numerous past economic agreements between Tehran and Doha in recent years, such as the agreement from February 2014 to create a joint free trade and economic zones between the two countries. A further issue that contributed to the strained relations with Qatar throughout the years is the cooperation of the Qatari-based news outlet al-Jazeera, which had been accused by the aforementioned countries of attempting to undermine their, as well as their regional allies’, governments. That said, despite these strained relations, Qatar and the other GCC countries’ relations can be characterized over the past several years by intermittent escalation and rapprochement between the sides. For instance, on December 9, 2014, Qatar agreed as part of a GCC summit, to establish a regional police force in order to improve coordination regarding drug trafficking, money laundering, and cybercrime, as well as announced its “full support to al-Sisi-led government in Egypt”. This followed Saudi officials’ March 9, 2014 threats to impose sanctions against Qatar, including in the form of sea blockade, in light of Doha’s persistent support for Muslim Brotherhood-linked elements across the region. However, the complete cutting of diplomatic relations between the aforementioned Saudi-aligned countries is highly notable given its wide scale and scope, as it includes significant restrictions on Qatar and its citizens. We assess that this escalation is linked to global and regional geo-political developments, largely with regards to Iran and the new Donald Trump administration in the US. With this in mind, in recent years, under the Obama administration, relations between Saudi Arabia and its allies on one side, and Washington on the other, were oftentimes strained due to the US’ perceived efforts to approach Tehran, which was likely viewed by Riyadh as coming at its expense. In light of the aforementioned normal relations between Qatar and Iran, Saudi Arabia and the other GCC countries were likely felt compelled to prevent Qatar from approaching the Islamic Republic too much, as this would have significantly undermined their sense of security and regional interest. Since President Trump’s inauguration, Washington increased its anti-Iranian rhetoric, while at the same time strengthened its ties with Saudi Arabia. This is highlighted by the May 15 UAE-US defense agreement, as well as the 350 Billion USD agreement between Riyadh and Washington involving an arms deal, and Saudi investments in the US. Thus, there remains a potential that the recent visit of President Trump to Saudi Arabia in late May, as well as the US’ growing support for Saudi Arabia and its allies, motivated the Kingdom to implement these measures, as part of the shared interest with the US in tackling Iran and its allies’ influence throughout the region. With this in mind, given Saudi Arabia’s decreasing need for Qatar’s cooperation on security and political support amidst the ongoing rivalry with Shiite Iran, it is likely that Saudi Arabia assessed that it is no longer obligated to maintain positive bilateral relations with Qatar, prompting this development. The development comes amidst a diminishing political influence of the Islamist Muslim Brotherhood organization across the Middle East and North Africa over the past two years. In this context, it remains possible that Saudi Arabia no longer felt compelled to maintain good relations with Qatar, following the reduction of the threat stemming from the Muslim Brotherhood, as opposed to previous Saudi attempts to pressure Qatar to abandon their support for the Islamist organization in return for the improvement of relations with the other GCC countries. Travel to Qatar may continue as normal while adhering to cultural norms and avoiding making any statements critical of the Qatari Emir and government officials, despite the aforementioned new restrictions. That being said, those operating in Qatar over the coming days and weeks are advised to stock up on food and basic products, due to the possibility that these will be in shortage due to the declared measures. Those operating throughout the Middle East and North Africa, and particularly in Saudi Arabia, Bahrain, UAE, and Qatar are advised to remain cognizant of developments and potential effects on travel and business continuity given the current lack of full information regarding the various restrictions that will be in effect. This is particularly relevant for the possibility of unexpected border closures between the relevant countries over the coming days and weeks. According to statements made by the Egyptian Armed Forces (EAAF) Spokesperson, the Egyptian Air Force (EAF) targeted “terrorist gatherings” in Derna during the overnight hours of May 26-27, and in an unspecified area in Libya during the morning hours of May 27. The airstrikes were conducted after “confirming the targets’ involvement in planning and conducting the May 26 attack in Minya Governorate”. Moreover, the Libyan Air Force (LAF) stated that the airstrikes were coordinated and supported by it. 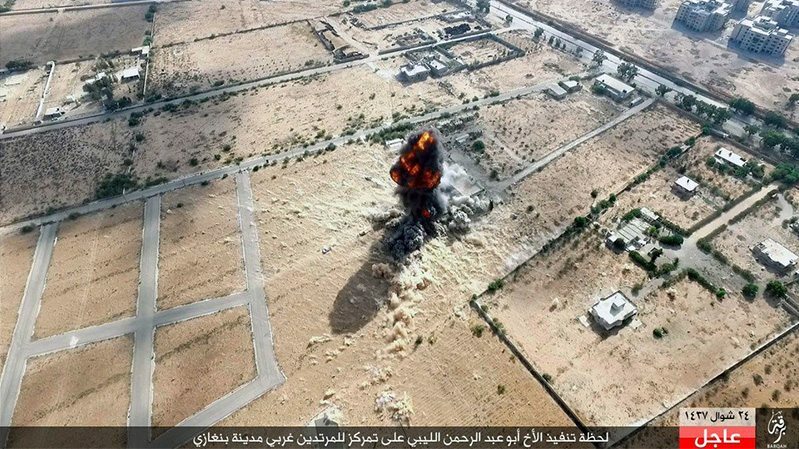 Reports indicate that between six and ten airstrikes targeted locations in Derna, while at the time of writing there are no indications of other locales in Libya that were targeted. 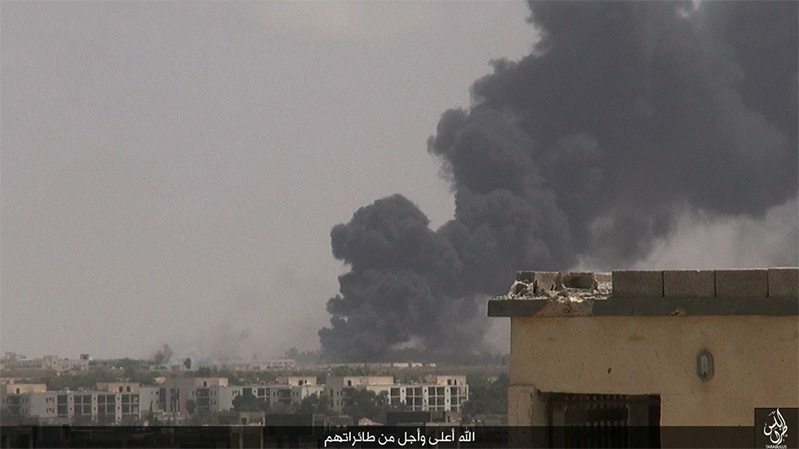 Meanwhile, the Islamic State (IS) claimed responsibility for the Minya attack during the afternoon hours of May 27. The developments are notable given the rarity of direct Egyptian military intervention in Libya, and more so ones that are publicly announced, with the most recent incident being the airstrikes in Derna following the execution of 21 Egyptian Copts by the Islamic State (IS) in Libya on February 16, 2015. Moreover, it is notable as Derna is currently the stronghold of the Mujahideen Shura Council of Derna (MSCD) after having entirely expelled IS from the area on April 20, 2016. In this context, despite their links to al-Qaeda, the MSCD is mostly a domestically-oriented militant group, and along with their established and long lasting conflict with IS is unlikely to assist the group, and therefore is not likely to have direct links to the Minya attack, particularly as it was claimed by IS. In this context, these airstrikes were more likely meant as an immediate show of force for the Egyptian populace and the international public opinion in wake of the attack, rather than actual military retaliation for it. This is particularly likely as mounting efforts by Egyptian authorities, chief among these is the nationwide state of emergency enacted in wake of the Palm Sunday attacks on April 9, failed to prevent the recent attack. As such, the Egyptian government likely felt compelled to take what will be perceived as extreme measures in order to project the extent of their efforts to protect its country and citizenry from militant attacks. This is especially aimed towards the Coptic minority which was the target of all four recent large scale IS attacks in Egypt, in an effort to offset IS’s strategy of exacerbating sectarian tensions and turning the religious minority against the government. With this in mind, Egypt likely chose to attack Derna for several reasons that are unrelated to alleged direct involvement in the Minya attack. It is in relative close proximity to Egypt and thus well within range of Egyptian aircraft without requiring special planning and logistical support. Furthermore, the city is already negatively associated by the Egyptian populace due to the aforementioned February 2015 events. Additionally, it has been a target for the Libyan National Army (LNA) for several years, thus intelligence of locales and personnel that are still related to global jihad elements, even if not to IS, and are therefore considered “legitimate targets” was easily acquired through the established cooperation between the LNA and Egypt. With this in consideration, it cannot be ruled out that the airstrikes were also meant to serve as direct support for the LNA in their Derna campaign, as the LNA have persistently been unable to allocate sufficient resources to the capturing of the city, due to the need to address several conflict zones that are distant from each other. Furthermore, the MSCD are likely perceived by Egypt both as a destabilizing factor for Libya, as well as a potential long-term threat to Egypt due to the group’s ties to al-Qaeda. As such, strengthening the LNA is within Egypt’s government’s interests due to the alliance between the sides, as well as the fact that a situation in which the LNA fully controls eastern Libya will prevent a spillover of militancy from the country into Egypt. FORECAST: Taken as a whole, it remains possible that Egypt will conduct additional airstrikes in Libya over the coming days and weeks, while it will likely increase its direct support for the LNA in this period. Additionally, it cannot be ruled out that Egypt will initiate a limited scale ground operation in Libya in the coming weeks. Travel to Cairo and Alexandria may continue while adhering to all security precautions regarding militancy and civil unrest. Consult with us for itinerary-based travel recommendations. Avoid all travel to the North Sinai Governorate and border areas with Libya, Sudan, and Israel due to the persistent risk for militant attacks, kidnappings, and general lawlessness. It is advised to defer all travel to Tripoli and Benghazi at this time due to ongoing violence, threats against foreigners, and the risk of a broad deterioration of security conditions. We advise at this time that those remaining in Tripoli and Benghazi should initiate contingency and emergency evacuation plans due to deterioration in the security situation. Contact us at [email protected] or +44 20-3540-0434 for itinerary and contingency support plans. We further advise against all travel to Libya’s border areas at this time due to persistent violence and lawlessness in these regions. Several prominent political actors, supported by various foreign countries, are currently active in Libya in various spheres of influence, some of which overlap. Despite attempts made towards unification including the announcement of a “unity government”, political rifts have deepened in recent weeks. In this context, the political instability of the country is expected to continue, both in a dichotomy of two governments competing for hegemony, as well as in internal rivalries within the various political layers. Similarly, numerous armed factions operate throughout Libya, some supported by foreign actors (including such that are present on the ground), and hold conflicting or overlapping sets of ideologies and interests with each other. Despite taking measures towards the elimination of militancy, mostly that posed by the Islamic State (IS), the continued political stalemate and deteriorating economic situation, mostly related to the inability to produce and export oil in sufficient quantities, poses a risk of escalation in armed conflict. Overall, a resumption of large scale hostilities between rival armed factions remains possible. As a result of these factors, the potential for a significant stabilization in Libya over the coming months remains low at this time. Eastern Libya: Generally under the control of the House of Representatives (HoR)/Libyan National Army (LNA), with Islamist militant pockets of control. 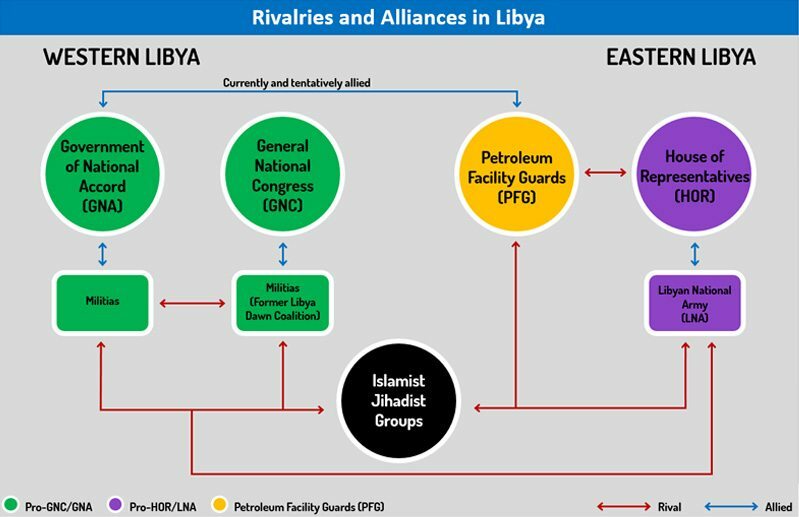 Central Libya: Convergence of control by LNA, Petroleum Facility Guards (PFG) and pro-Government of National Accord (GNA)/General National Congress (GNC) forces, with Islamist militant pockets of control. Western Libya: Presence of forces that support the GNA and others that support the GNC, with a pocket of LNA control. Southern Libya: Generally ungoverned territory with heavy presence of tribal militias who hold shifting alliances. See below, “Actors and Interests”, for a more in-depth discussion of the major players. Despite its unprecedented recent successes, the LNA has suffered some local setbacks, namely the inability to hold areas that it “liberated” in Ajdabiya in March-April, as is manifested by the renewed militant territorial presence and operational capabilities in and around the city. These are likely the result of the LNA’s need to engage in several active fronts that are also physically distant from each other at the same time, thus forcing the LNA to overstretch its resources. Moreover, the LNA’s airpower, one of its main leverages, is inconsistent in its operations due to faulty maintenance (as a result of lack of proper resources) and overuse. Moreover, in Benghazi, the primary area of operations for the LNA currently, the LNA faces persistent challenges in operating in a dense urban area and among civilians, a weakness often successfully exploited by militant groups that battle the LNA. Lastly, the recent exposure of the French military presence in Libya prompted widespread local opposition, mainly from (but not exclusive to) civilians in Misrata and Tripoli, as well as the Grand Mufti, and is expected to cause opposition from the local population, as well as political complications. In the long term, that may mean that France will have to scale back its missions in Libya, or possibly entirely withdraw from the country, which will have particularly adverse effect on the LNA, France’s main beneficiary in Libya. These factors combined will likely result in a general status-quo of fighting in the east in the coming period, with the LNA making advances in certain areas, however at the expense of losing grounds or influence in other areas. 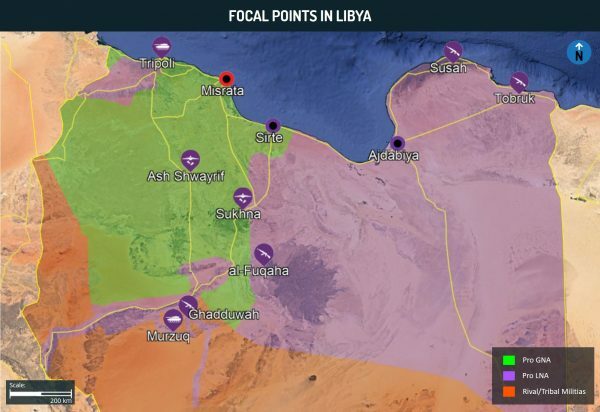 As opposed to the east, in the Sirte Basin, pro-GNA forces (mostly in the form of militia groups from Misrata) were largely not required to fight in several different, far-removed focal points. As a result of this, along with an at least temporary alliance struck with the PFG in the east of the basin, pro-GNA forces were therefore able to focus their forces to the maximum effect against IS and achieve far-reaching results. Given that IS’s main fighting forces have mostly been contained to a small area, which is besieged from all sides, we do not assess that it currently has the capabilities to break the encirclement and reverse Misrata’s achievements. The latter will likely opt to generally maintain the siege for the coming period in order to avoid high casualty tolls that are attributed to fighting in urban terrain, and will likely mostly bombard the city with air and artillery forces. With this in mind, unless something unexpected – such as premature renewed fighting with the LNA or PFG occurs, we assess that Misrata’s capabilities in ultimately capturing Sirte will remain high. However, it is important to mention that while IS’s capturing and expansion of territory in the Sirte Basin since February 2015 served to temporarily mitigate hostilities between the LNA and the then-Libya Dawn, whose main focal point of fighting prior was the control over oil facilities in the Sirte Basin, and mainly the oil terminals along the coast. In this context, the eventual removal of IS as a major threat may in fact reignite fighting (depending also on the political situation at the time) between the LNA, Misrata, and the PFG over the control of the numerous valuable energy resources in the area. Indications of this were already apparent in early May, when forces from Misrata and the LNA, maneuvering to positions prior to launching an offensive against IS, briefly but intensely clashed with each other near Zillah and its nearby oil fields. This is particularly likely since oil and gas, which are abundant in the Sirte Basin, are Libya’s main exports, even at the significantly reduced current output, and are therefore a key factor of income, thus rendering the control of energy facilities instrumental for any actor seeking influence in Libya. Despite the GNA’s arrival in Tripoli and the subsequent large support base they were able to rally among local militia, the fractioned nature of the “military” structure in the west, which also characterized the previous Libya Dawn coalition of militia forces, persists. This results in occasional, intense, fighting between militia groups both in Tripoli and its surrounding areas, including between those that seemingly operate under the same group, over a variety of issues including control and patronage of areas, dominance over smuggling routes, as well as over local disputes, in addition to fighting that occurs between militias of rival political affiliation, namely the GNA and GNC loyalists. This situation is underscored by the most recent fighting in Garaboulli, 60 km east of Tripoli, on June and 21 which resulted in at least 29 deaths and dozens of wounded. Moreover, fighting intermittently occurs between militia groups that support the LNA and the HoR, and those that support the rival factions, along the “border” west and southwest of Tripoli. The presence of pro-LNA forces in such relatively close proximity to Tripoli, in addition to the fragility of the political situation, runs the risk of an expansion in hostilities over the coming six months, particularly since multiple LNA commanders have announced in the past that their “ultimate goal is Tripoli”. This risks will be significantly heightened should hostilities between the LNA and pro-GNA forces in the Sirte Basin be resumed, potentially resulting in a spiral effect that will renew a nationwide state of hostilities such as the one that was prevalent in Libya approximately one year ago. Despite the proliferation of militant groups in Libya, these organizations are mostly invested in maintaining their activity around their current areas of operations, namely in and around Derna, Benghazi and Ajdabiya. An exception to these is IS, who has both the interest and the proven capabilities to operate across Libya, and has in fact conducted attacks across the country in recent months. While IS’s loss of territory, material, and personnel first in Sabratha (west of Tripoli) in March, then in Derna in April, and finally in the Sirte Basin since June, has significantly impaired their resources base and operational capabilities, this exact same process may lead the group to conducting more high-profile attacks. This is in order to maintain the group’s diminishing prestige and project an image that it is still relevant despite its losses, both regionally and globally, due to its setbacks in Libya, as well as in Syria and Iraq. Moreover, al-Qaeda in the Islamic Maghreb (AQIM), who is a regional competitor of IS and draws from similar recruitment and funding pools, also has an operational presence in the country and may seek to take advantage of IS’s current setback to increase their own influence in the country, which will be manifested by militant attacks. In this context, while the frequency of militant attacks has declined in recent weeks, in the long term, the increased motivation and remaining capabilities of the numerous militant factions serve as indications that attacks may occur nonetheless. In light of precedent and the global jihadi groups’ strategies, such attacks are likely to prioritize strategic locales such as the energy sector (as noted before), as well as foreign companies and diplomatic missions, to further damage the economy, aggravate the instability of the state, and capitalize on the resultant void that allows militants to prosper. Since its arrival in Tripoli, the Presidency Council of the GNA has successfully expanded their sphere of influence in western Libya. That said, their influence was generally unsuccessful in breaching into the east of the country, which is still mostly under the auspices of the HoR. Furthermore, there is a common perception by locals of the GNA as being foreign installed and directed, which was likely aggravated by the “invitation” of US airstrikes and foreign intervention in Libya. This image significantly impairs the GNA’s domestic credibility, despite being presented as the unity government of Libya. The rift between the GNA and HoR is aggravated by the continued inability of the HoR to hold a vote to ratify the GNA, which is perceived by the latter as an intentional move to diminish its legitimacy. Additionally, the fact that the GNA continues its own implementation despite not being vetted by the HoR is perceived by the latter as an act of marginalization of the body, which is set to be the legislative authority of the unity government. 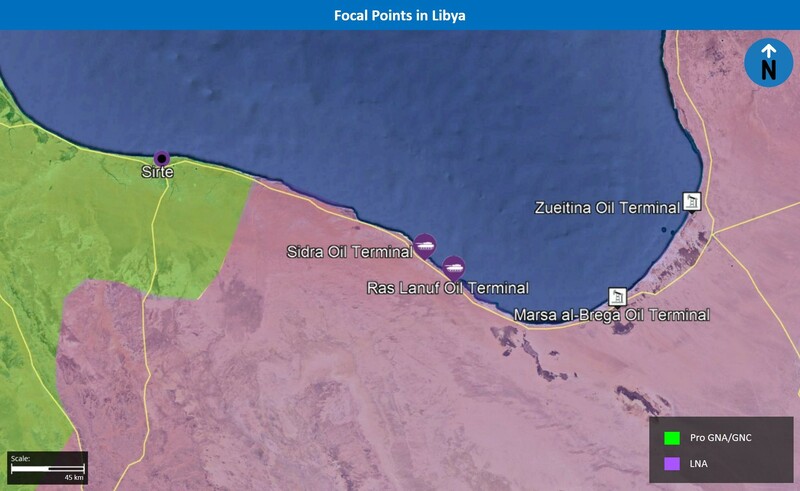 Most recently, political rivalries peaked when, following an agreement in late July between the GNA and PFG to reopen the major oil terminals in central Libya in late July, the HoR threatened to attack vessels entering Libyan territorial waters without the latter’s authorization. In this context, the HoR will likely continue to fail meeting voting deadlines on the ratification of the GNA, as it postpones the latter’s full implementation without outright rejecting it. This, in turn, blocks what some of the HoR members perceive as a challenge to their aspirations of sovereignty, without attracting the negative international attention and potential ramifications that will accompany an official vote against what at least the UN perceives as a unity government. Should this process persist, it is liable to prompt the Presidency Council to continue to construct the GNA without ratification, which in turn will further discredit its domestic status and sanction political opposition to it. This will likely eventually lead to the GNA establishing their primacy in the west, but remaining a second government in Tripoli and western Libya vis-a-vis the HoR, mostly in the east. That being said, it cannot be ruled out that the HoR will eventually ratify the GNA. However, even without the political branch’s dichotomy, Libya’s institutions, and more importantly its various fighting groups, still hold many conflicting interests and ideologies, along with personal animosities between leaders of these groups, which will significantly challenge the implementation of a full unification of Libya. Taken as a whole, the most stabilizing potential outcome for Libya, and the one that seems least likely at the time of writing, will see a single domestically and internationally recognized government which struggles to exert its full control over Libya, in which various competing groups will still clash with each other to maintain their respective interests. However the most likely track at this time, which will maintain and possibly exacerbate Libya’s instability, is one in which the GNA continues to compete with the HoR, and to a lesser degree with the GNC, over full control of Libya, in effect resulting in a fractured state. Government of National Accord (GNA): Currently based at the Tripoli Naval Base, the GNA is intended to be a unity government and is a product of the Libyan Political Agreement (LPA) signed in December 2015. The LPA allows for the transition of the House of Representatives (HoR) and General National Congress (GNC) into the GNA’s legislative body and advisory State Council, respectively. However, this transition must be ratified of a vote of a special majority by the HoR, which so far has not been able to convene the needed quorum for such a vote. During this continued transition period, the GNA is currently considered the “internationally recognized” government and enjoys the support and the backing of the UN. Its sphere of influence is fractioned mainly throughout western Libya, particularly in greater Tripoli and Misrata. House of Representatives (HoR): The previously “internationally recognized” government, the HoR’s parliament is based in Tobruk and executive branch in al-Bayda. Its sphere of influence is generally in eastern Libya, with some pockets of support in the west, particularly southwest of Tripoli. The HoR is currently supported politically, militarily, and economically by several countries, most prominent the United Arab Emirates (UAE) and Egypt. While these countries generally recognize and support the LPA, they capitalize on the fact that the HoR has not ratified the agreement as pretext to consider it non-valid at this time, in order to continue supporting the HoR and not the GNA. 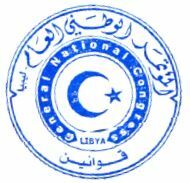 General National Congress (GNC): The GNC previously controlled the majority of western Libya and is now mostly defunct, mainly since some of its members unilaterally broke away in early April and started fulfilling the role of the State Council, despite the GNC leadership’s opposition. While the GNC currently has very little political power, it still enjoys support from various militias, as well as from Grand Mufti al-Ghariani, thus retaining a partial sphere of influence in the west, particularly in Tripoli and its surrounding areas. Both Turkey and Qatar originally supported the GNC, but this support has diminished since the start of the GNA’s implementation. Other groups: Both the ungoverned and the governed areas of Libya are dominated by politics based on tribal, clan, and ethnic backgrounds, as well as place of residence and origin. In this sense, it is not uncommon for cities that both support the same political body, to be at odds due to historical or other rivalries among their residents. Similarly, militias from the same city who support the same political organ may have a strife over tribal or other rivalries. Dozens of militia and militant groups currently operate in Libya, each with its own ideologies, interests, and political allegiances. Very broadly, these groups are categorized into six different competing factions, with rivalries persisting even within some. Militia groups that support the Libyan National Army (LNA), which is commanded by Lieutenant General Khalifa Haftar and holds patronage relations with the anti-Islamist House of Representatives (HoR). Mainly fighting in the east of the country, with pockets of support in the west. Their main areas of operations currently are around the city of Derna, in Benghazi, in and around Ajdabiya, as well as the area between Benghazi and Ajdabiya. Militia groups supporting the UN-backed Government of National Accord (GNA), based at Tripoli Naval Base. Currently engaged in an ongoing campaign to remove the Islamic State (IS) from the city of Sirte (represented primarily by forces from Misrata), as well as taking part in intermittent inter-militia fighting in western Libya. Militia groups, formerly known as the Libya Dawn coalition, supporting the pro-Islamist General National Congress (GNC), based in Tripoli. While mostly defunct, they still retain some fighting capabilities which are mostly invested in fighting rival militias, mainly those that support the GNA, in Tripoli and other areas in western Libya. Petroleum Facility Guards (PFG), an independent faction that holds shifting alliances (currently allied with pro-GNA forces), however ultimately strives for its own goal of a federalist Libya. Currently is seldom fighting and mostly retaining its forces. Was briefly involved in operations against IS east of Sirte in cooperation with Misrata. Islamist jihadist groups such as the Islamic State (IS), as well as additional ones that hold varying levels of connections to al-Qaeda, the GNC and/or the Grand Mufti of LibyaSadeq al-Ghariani, including Ansar al-Sharia, Revolutionary Shura Council of Benghazi (RSCB), Mujahideen Shura Council of Derna (MSCD), and others. Hold territory and operational capabilities mainly in and around Derna, Benghazi, Ajdabiya and Sirte. Tribal militias, mostly consisting of either Tebu or Tuareg ethnic tribes, who may be at times supported by fellow tribesman from neighboring countries, and hold shifting allegiances towards the various players. Operate mainly in the ungoverned territories in southern Libya, in proximity to the border with Egypt, Sudan, Chad, Niger and Algeria. The United States: On July 19, Chairman of the Joint Chiefs of Staff General Joseph Dunford confirmed that the US has routine and ongoing operations in Libya that are coordinated with the GNA, as well as other operations that are not coordinated with them, without specifying their nature. Later, on August 1, the US Department of Defense (DoD) announced that US aircraft targeted IS positions in Sirte on August 1, at the request of GNA leadership. In addition, the DoD stated that further airstrikes targeting IS in Sirte would be conducted in support of “GNA ground operations”. There are many indications of US ground and aerial operations in areas both under GNA (and previously GNC) control as well as in HoR territory. 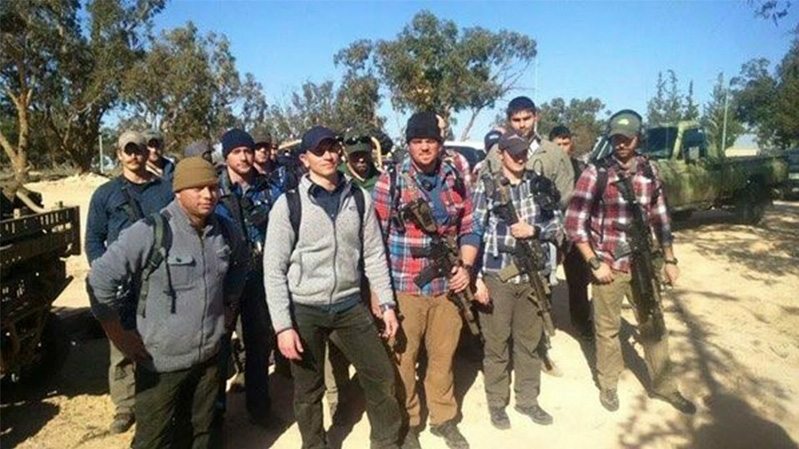 The most prominent evidence of US ground presence in Libya emerged as early as December 16, 2015, when a Special Operation Forces (SOF) team sent to advise the LNA was expelled from al-Watiyah Airbase by local militias, compelling the DoD to confirm that the US military is dispatching “advisors” toLibya. Italy: Provides frequent and overt logistical support primarily to the city of Misrata, most often in the form of medical evacuation of both civilians and combatants wounded by IS actions. There are local reports of regular presence of Italian SOF teams providing training, advising and liaison with locals, however these remain unconfirmed at the time of writing. France: On July 17, an Islamist militant group claimed to have shot down an LNA helicopter carrying Libyan, French and Jordanian nationals. While there are conflictingreports regarding the type of helicopter and the reasons for which it crashed, on July 20 French President Francois Hollande confirmed that three French operators were present aboard a helicopter that crashed due to technical reasons in Libya; reports additionally indicate that the three were Directorate-General for External Security (DGSE) agents. This announcement accounts for the first official and public admission of direct French operations in Libya, while local reports regarding relatively large scale French presence and operations in Benghazi circulated since February. United Kingdom: There are various local reports regarding direct British involvement in assisting Misrata forces in their campaign against IS in Sirte. While unconfirmed reports suggest that UK forces directly engaged IS forces in certain instances during May-June, both on the ground and with use of airstrikes, Misrata’s military spokesmen stated that the UK is only providing intelligence support, including by operating tactical unmanned aerial vehicles (UAVs), as well as in advising local forces. Russia: On May 1, the LNA’s official spokesman announced that the LNA’s operations are assisted by Egypt, the UAE and Russia. This accounted for the first official recognition of Russian involvement in Libya. 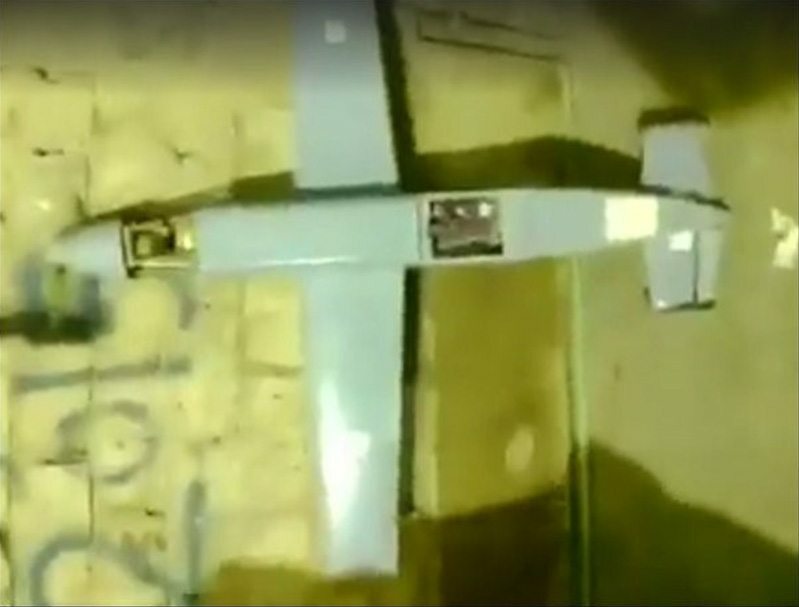 While there is little open source information regarding potential Russian operations in Libya, on January 31, a Russian Orlan-10 tactical UAV crashed near Ajdabiya, an incident that remained unexplained since and may serve as an indication for such ground operations. With the world’s attention fixated across the Mediterranean on the spiraling Syrian conflict, the efforts of Libya’s elected leaders to rehabilitate their nation have been stung by the poisonous barb of militia power-politics. On May 5, the popularly-elected General National Congress (GNC) passed the Political Isolation Law, prohibiting former Gaddafi regime members from holding political office over the next ten years. The law reportedly passed with a majority of 164 votes out of 200 total, with only four members rejecting the legislation. The overwhelming support for the law in the GNC is as much as an illusion as a desert mirage. 10 days prior to the vote on April 28, hundreds of staunchly “revolutionary” militiamen from Misrata and Tripoli’s outskirts entered the capital and laid siege to top government ministries, demanding they be purged of all “Gaddafi loyalists” and refusing to depart until a vote on the Political Isolation Law was held. For days, the Zidan administration stood firm against their demands, while a number of GNC members insisted on holding the vote in eastern Libya, away from the militias’ gun-barrels and armored vehicles. Hey Buddy!, I found this information for you: "Strategic implications of Libya’s Political Isolation Law". Here is the website link: https://www.max-security.com/reports/strategic-implications-of-libyas-political-isolation-law/. Thank you.